I'm still traveling, so this will be a quick update. 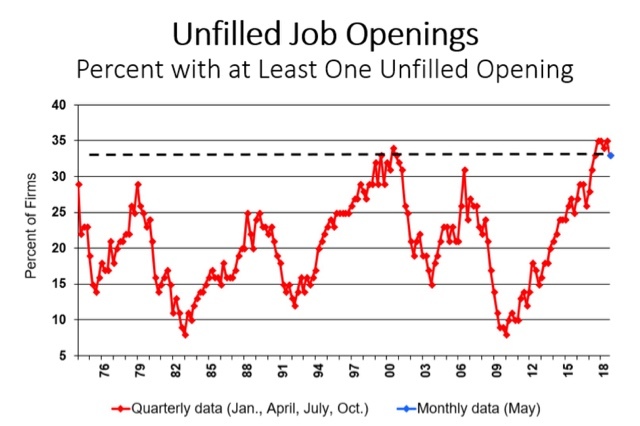 In re yesterday's JOLTS report, the main take seems to be that job openings were higher than the total number of unemployed, so presumably they could all be hired and we'd have actual full employment next month, right? I don't think so. Month after month, hires have totaled considerably fewer than openings for several years. If full employment were so close, why wouldn't hires be catching up? And every month, there are new layoffs, quits, and other separations, all of whom (except for those who retire) are available to fill those job openings. No sign yet of either turning down, although both may be plateauing. so there's no danger sign of any oncoming economic downturn in this month's report. The YoY comparisons will get more challenging starting next month, as hires have been within a 2% range since last May, and have not made a new high since last October. Since we are late in the cycle, my anticipation is that we will indeed see negative YoY readings on hiring at some point in the second half of this year, but we'll see. A couple of months ago I wrote that raising wages may have become a "taboo," i.e., that in some cases employers may be refusing to raising wages, even though it may be costing his money. One of the items I relied upon was from the NFIB, as small business owners presumably are not "monopsonies." 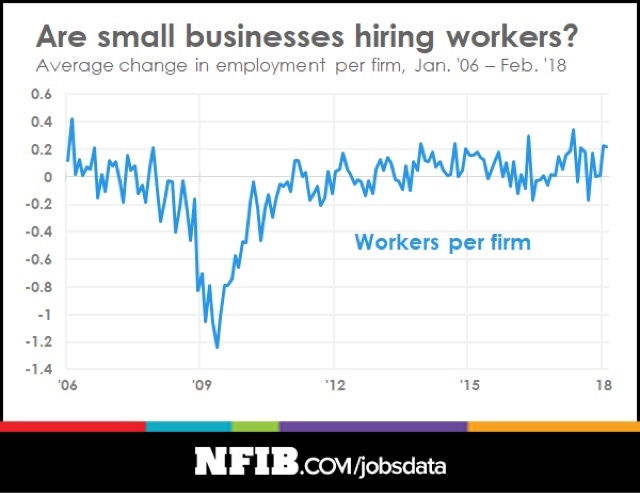 As of February, the last time I had data, small business owners were complaining of inability to fill positions, but were not raising wages. In the last three months, employment growth per firm has finally broken out to the upside. As I noted then, it looks like wage growth for ordinary workers may finally be starting to accelerate. 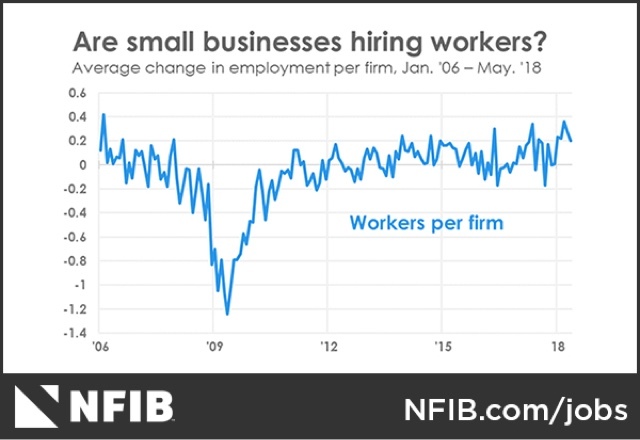 While it seems crystal clear that the tax cuts for large businesses are just going into stock buybacks, it is certainly possible that small businesses are using some of their extra cash to increase pay for new workers. 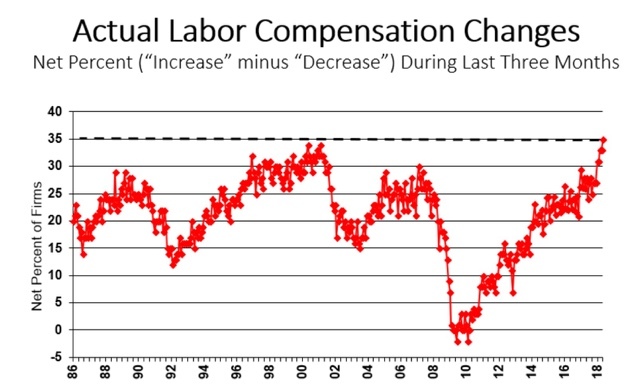 If the behavioral paradigm I hypothesized -- that the taboo against raising wages has been undergoing an extinction burst -- the most recent data from the NFIB supports that employers are finally conceding that the Great Recession-era behavior of freezing wages is no longer successful.